This 14 watt from TCP Lighting allows you to easily replace an incandescent without anyone noticing. 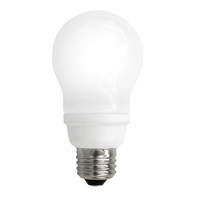 With an 800 lumen light output, this bulb provides enough light to replace a 75 watt incandescent bulb. The 2700K color temperature produces a warm white glow. This 14 watt CFL has an armor coat to protect it from shattering when broken, and G2 instabright technology allows this bulb to reach full brightness in seconds. With an average lifetime of 8,000 hours, it won't require frequent replacement the way an incandescent does.